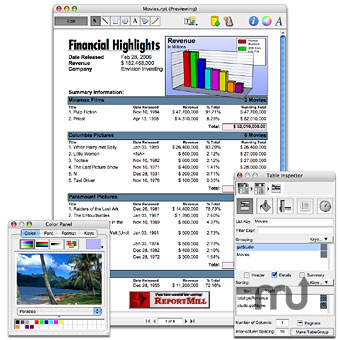 Developer website: ReportMill Software, Inc.
Is there a better alternative to ReportMill? Is ReportMill really the best app in Java category? Will ReportMill work good on macOS 10.13.4? ReportMill is the best Java application reporting tool available for dynamically generating reports and Web pages from Java applications in formats such as PDF, HTML, Flash, Excel and more. ReportMill combines an easy-to-use page layout application and a powerful Java API in a single compact jar file, which is remarkably easy to integrate into your custom Java application. ReportMill needs a review. Be the first to review this app and get the discussion started! ReportMill needs a rating. Be the first to rate this app and get the discussion started! Running as Java code inside your application, ReportMill seamlessly harvests data directly from any Java dataset, whether EJBs, custom Java classes, Java Collection classes, JDBC ResultSets or any combination of these. This is much more efficient than traditional reporting tools, which often require developers to repackage existing Java datasets as the original SQL query, then force a redundant refetch and some potentially risky inter-process communication. This architecture also provides unique access to custom business logic found in the developer's object model, providing a significant savings by reusing this code instead of forcing a rewrite in proprietary template macro languages.